Lord of Magna was one of the silhouetted games teased by XSeed a few months ago. It is a 3DS game that follows the story of Luchs (thankfully you can rename him) and how his life changed once he met a mysterious girl named Charlotte. Together they find more women like her and must discover their true origin and purpose. I have to first talk about the battle system, since it is by far the most unique aspect of the game. It first appears to be a grid-less strategy RPG, which it mainly is. However, the main enemy units are "leader" units, and they can summon up to 10 grunts. These grunts have very low HP and attack power, but move together with the leader as a unit. Attacking the grunts will kill them and send them flying backwards. If they collide with another grunt, that grunt will die and roll backwards. If they hit a leader or generator, they will do a bit of damage to them. The idea with the grunts is to try to knock them into each other to kill as many as possible, almost like dominoes or bowling. It sounds strange on paper and works...ok. They don't always seem to get knocked back as you think they would, and they don't like to line up in ways that allows you to get a lot with one hit. If you do manage to hit 10 with your attack, you get another turn for that character. The leader units can summon more grunts, but it costs them HP to do so. Generators are stationary and don't attack, but every few turns will summon leader units, again at the cost of some HP. While it is more efficient to take out the leaders first, it is very viable to keep taking out the grunts until the leaders don't have the HP to summon any more. It is a much longer process though. Grunts give no experience when killed, but there are many sub-missions to kill all enemies that reward you with an item, so there are reasons to clean house. All experience gained is shared with the four people in the battle. That makes it less painful to train up lesser experienced characters. Lord of Magna's story is decent. The dialogue is fine, but there are a few story points that are just glossed over, leaving a few questions that work against the story as a cohesive whole. Plus, you can't skip scenes. You can fast-forward, but not skip entirely, which really hurts when replaying the game. I'm sure you can't skip because there are dialogue choices, but I would prefer to skip at least the scenes without them in subsequent playthroughs. It is pretty easy to see what will advance the plot, since it is often talking to the character(s) with crowns over their heads, so I never got lost, plot-wise. There are also Heart Events, which will help the main character get closer to the seven girls. They have three each, and you usually have to choose among several of the girls which event to do. The Heart Events are time sensitive to the plot. If you miss Lottie's second one, for example, the next time it is possible to do hers it will be the third. While any missing ones can be done on subsequent runs through the game, it makes character development seem sudden if you first do the girl's third event, or something along those lines. Plus, it seems that you have to do one when they are presented. This is fine until you have them all. There's no real reason to repeat them, so why force repeat players to do them? My first run through the game took just shy of 24 hours. It would have been 20, but the final boss fights are stacked against you in ways that will likely require grinding. I won't ruin who or what the final boss is, but you fight it basically three times. The first isn't too hard and feels appropriate for that stage of the game. The next time, you cannot use your main character or the girl you have chosen during the game. Since they are likely to be two of your higher level characters (at least in the first run), you have to somehow make do without them, or train up at least one alternate to cover. That's where the grinding comes in. Plus, to make it more annoying, the final boss has a near instant death attack when between 50 and 25% health. It doesn't exactly kill you, but instead does about triple your likely HP at that point of the game... which is pretty much the same effect. The final form of the boss has more than three times the HP of anything else fought to this point. While it isn't quite as dangerous damage-wise, it takes a long time to whittle down all that health. Other fights in the game can be stacked against you, but aren't near as difficult as the final two. There is some replay value to the game. There are endings with each of the girls, and even achievements you can unlock. Thankfully, the game has a new game+ function that is pretty good. You can choose two people's levels and five items to keep into the next run. Each time you beat the game, you can choose an additional person. Plus, the people you choose keep on their equipped skills. If you are creative in choosing what they have on, you can then keep more than the five you choose directly. It's a bit strict since you can't keep everything, but the ability to choose is really nice. Overall, Lord of Magna is pretty fun. The only point I didn't enjoy was the final two fights and the grinding I had to do so I could pass them. It is a bit rough, but fun to go through at least once. I feared that the game would be filled with fan service, but there's barely any. I was intending to stop after my first run through, but ended up doing it again before writing this. I would encourage SRPG fans to at least try the game for its unique battles. Operation Abyss: New Tokyo Legacy is a dungeon crawling RPG in the vein of Wizardry. Or Class of Heroes, which is the same as Wizardry. While those aren't my cup of tea, I spent some time with the game, but also allowed my wife, a huge fan of the old Wizardys, to take a spin with the game. Spoiler alert: I still don't have my Vita back. As any competent Wizardry clone, you assemble your team from some pre-built party members of various classes, or make your own. Always one for customization, both my wife and I quickly went to work to fill our team with our own creations. At the start, the game offers you basic, where you just select a pre-made protrait, or classic, where you assemble your person by choosing all of the parts (hair, eyes, etc.) yourself. Again, we went with classic. After looking at the portraits you can select, and seeing how silly your party looks with component equipment attached... we probably should have went with basic. Still, the game gives you a full party of six, so I spent over an hour to make my new (real) party, unequip the pre-mades and equip my team. While most of that was cycling through the options to make my people look less silly, I have to mention the menus for the game. They're bad. Simple functions are hidden behind other menus. It takes way too long to figure out how to do mundane things like unequip a weapon. It doesn't help that a lot of the menu functions are renamed to cutsey things. Want to buy something? That's under "issue". Want to sell? That's "deliver". The menus would at least be better if they were named standard things, so they are easy to find. Other than that, they need to reorganize where certain functions are for better usability. I eventually learned where things were, but I shouldn't have had to put that much effort into it. Well, let's get on to the gameplay. Operation Abyss is a dungeon crawler with turn based battles. You select your actions for the turn, then all of them play out in the order of everyone's speed. Magic uses a number of casts system instead of an MP system. Each cast of a spell takes one use, and each level has a certain number of uses. Of course, they are refilled if you pay the fee at the medical facility. There is also a unity gauge that allows you some extra attacks, like hitting the whole front row, bracing your defenses, or reliably running away. The enemies have some pretty unique designs, but there are a few that were clearly taken from Demon Gaze. There's even some crazy ones, like the Statue of Liberty looking one. The dungeons themselves are on a grid, and you move similarly. You can either move forward, turn, or strafe to the side. There are many hidden walls, doors and passageways that you can discover through several means. One of the blood codes (classes, basically) has an ability that makes it much easier to find them, but it isn't the only way. To make things more annoy-- I mean interesting, there are several types of gimmick panels. They can be dark panels, so you can't see the screen, turn panels that mess with your sense of direction, or other similar things that are there to bother you. So far, they aren't near as prevalent as Wizardry itself, or even last year's Demon Gaze. You still need to contend with them, but each dungeon isn't build around them, nor do them seem as numerous as similar titles. However, they do like to re-use the dungeons. Several dungeons are accessible through other dungeons instead of directly. It's a small annoyance, but definitely an annoyance. Although, it is not as big a problem as the lack of help you get if you are stuck. The instructions to continue the quests or story can vague on the side of useless. I'm not saying I want the game to hold my hand, but if you don't know where to go, a quest marker or at least something more helpful than "go and investigate" would be nice. Also, my wife encountered a glitch where she couldn't advance because a scene wouldn't trigger. I had no problems with that part, so it just was bugged for her. Once the game was reset, it functioned normally, but of course we didn't know what the problem was at the time. If the game was less vague or had a marker, we would have known something was up sooner and she wouldn't have wasted over an hour tearing her hair out. One thing I very much liked in Operation Abyss over similar games that I've played is the difficulty. It is a much more balanced game. Yes, it does get difficult (mostly thanks to the level cap), and it isn't necessarily easy, but it feels balanced. Enemies die relatively quickly, and don't do much damage early on. However, you have to keep your levels and equipment up, otherwise you will die. Death is still pretty serious. You have to pay a fee at the base to resurrect, or go into the dungeon to rescue the party if they are all defeated. The only way to save in a dungeon is by using an expensive item, so a party wipe will result in either training a secondary team or loading your last save, either of which will set you back a bit. Ugh. Operation Abyss is a dungeon crawling RPG in the vein of Wizardry. If you like those games, or last year's Demon Gaze, or other similar ones, you are sure to like Operation Abyss, too. My wife really likes the game, despite its shortcomings, and I had some fun for the time I played it. The idea of basically equipping what your class is instead of being it is neat. The game offers little help in where to go or even what you can do. I played for a few hours before figuring out there was a second page of quests, for example. Fans of Wizardry are sure to enjoy it, and it's balanced enough to ease new players in. Shooting Love 200X had somewhat of a stealth release recently on Xbox Live Arcade. Since return readers might know I am a fan of space shooters, I was excited at the prospect of another shmup (shoot-em-up) crossing over into the US. I was even more excited to give it a try. When you first boot up the game, you have to take a gamer age challenge, where it asks you to perform in a few shmup-based minigames. This part is reminiscent of Wario Ware and Brain Age. It rates how well you perform in a few key areas, and will calculate your "gamer age" at the end. At first, I got 40. That is a little older than I am, so I tried it later and got 24. That's lower than my actual age, so I felt pretty good about that. Anyway, a there are many variations on the different games that they judge you on, and many are unlockable so you can practice them. Which is good, since I'm not a fan of "you have a split second to figure out what is going on, now play this!" style. Once they are unlocked, I can practice them so when they show up in the gamer age challenge, I don't start with a rush to figure it out. Thankfully, that is not all that Shooting Love 200X has to offer. It also has three distinct shoot-em-ups to play. The first is called Exzeal. You can choose one of five ships (one is well hidden) that have different attack styles. One has a charge shot that flies straight ahead, another has a 5-way charge shot, the third has no charge shot at all, and the fourth normal one has a short range shot to the side. Obviously, each plays differently, and each gains a point multiplier bonus based off its primary function. For example, hitting multiple enemies with the first ship's charge shot will give a high multiplier, but just killing an enemy won't. The ship with no charge at all was my favorite. It seemed the easiest to make it through the stages. Actually, making it through the game is a challenge in and of itself. You only get so many continues, and it can be very easy to die. It is possible to gain some more continues, but it takes a lot of playtime to do it. While Exzeal seems more about points than making your way through the game, this isn't actually the case. It's both, which is unusual to me in space shooters. The second shmup game is Tri-zeal. This one was easily my favorite part of the whole package. You have only one ship, but it has three different weapons that you cycle through. Each weapon can by powered up five times to make them stronger and more effective. The spread shot shoots more bullets, the laser is stronger and there are more seeking missiles launched. As an added bonus, whenever a weapon is fully powered up, you will get some of when using the other weapons. This bleed effect is nice, since you get a nice reward for using a non-fully powered up weapon. I easily preferred the spread shot, as it was the most useful to me, and would power it up first. The third and final shmup contained in the package is Minus Zero. It has a strikingly different visual style, akin to Geometry Wars, and offers only lock-on shooting. The reticle is a fixed distance from your craft, and you can only shoot once you have passed it over an enemy. Once you have done that for one or more enemies, shooting will launch a laser at each target. Targeting and then eliminating as many as you can at once is the best way to get a high score. This was easily my least favorite of the three, and maybe the least attractive of the whole game. It wasn't bad, it just wasn't very fun for me. The achievements for the game are harder than I first thought. You have to find little hidden things, excel at the various gamer age games, and perform well or complete the three shmups. They aren't impossible, since you can set it on easy, but harder than it would first seem. There are some cool extras in the game, too. For one, you can start on the second player side, which is the first time I've seen this in a shmup that I can remember. You can also check the buttons from the pause screen. I'd recommend doing this, since all of the games seem to use a different button configuration. It's a strange decision to be sure, but you can configure them to your liking. 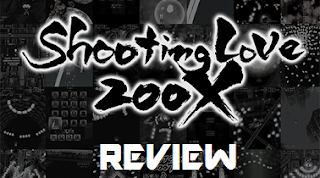 I enjoyed playing Shooting Love 200X. The gamer age games are fun once you know what they are. It's a crazy mix of shoot-em-ups/space shooters/shmups and Brain Age, and it works really well. There are also three different, full shmup games to play. I still don't like using that word, but it is much quicker to type out. Anyway, the whole package is great for shmup fans, especially the more retro inclined ones (Raiden, 1942, etc.) The gamer age games are more about reactive dodging than pattern memorization, while the included shmups are a good mix of both. An overall fun experience, especially Tri-zeal, which is my favorite part of the whole game. The second game that my buddy David lent me is Dragon Quest Heroes. In a similar vein to Hyrule Warriors, it is the merging of Dynasty Warriors and another property, the Dragon Quest series. It has some new characters, but most playable people are from previous games. To separate itself from the actual Warriors games, this one has MP for "spells" and even the ability to summon monsters to help defend certain areas. The spells are flashy and good at hitting areas, but I'm sure there's more to the whole system that I just didn't understand. The monster summoning is pretty cool, but they aren't that strong, so make sure to check up on them. It's at the least a new and unique system to add to the Dynasty Warriors tried and true gameplay. I played a few stages, and actually lost one or two, mostly because I couldn't read what I was supposed to do. I quickly figured out what to do, so the language barrier isn't insurmountable. It does make it harder to figure out what the skills do. Definitely look up some translations or better yet, wait for the localized version. To me, the biggest negative of the game is its fanservice. Usually I love these things, but the sound effects and music in the game is too retro for its own good. When something like Final Fantasy or some other property uses older music or sounds, it is sparingly, or it is the same tune but with updated instruments or something like that. The music and sounds of DQ Heroes just feels too antiquated when compared with the fresh visuals of the PS4 graphics. It's a weird juxtaposition. Even so, I really had fun with the game for the few hours I played it. I would have played it more, but I'd rather know exactly what I'm doing and what is going on, so I am content to wait for the localized version this summer. So far, Dragon Quest Heroes is very fun! It felt more like a Warriors game than Hyrule, which is a plus. So why not call it Dragon Warri.... oh, right.